Cheeky staffers, a resident monkey and unusual rooms ensure that you won’t forget a stay at Blue Tribes. Average rating 6.6 from 326 reviews. While the eastern side of Pattaya Beach has filled in on either side, things haven’t changed much at the small resort itself. A giant buffalo skull is still hung over the spacious reception and restaurant pavilion that fronts the beach, where you can grab a plate of Italian food before moving to the atmospheric bar with cushions at the candlelit tables. Behind the restaurant stand the large dark-wood fan bungalows scattered among trees, flowers and beach dogs that may compete with the monkey for your attention. Those closest to the beach are two storeys and afford sea views from lofts with cushions and hammocks. We’re not sure what the sleeping space looks like in these because they’re always full when we pass through. Situated a little further back, large single-floor bungalows come with firm queen beds and single beds raised off hardwood floors. All the way in back, the cheapest "garden" room we peeped was a tad musty; we’d suggest going for a cheaper bungalow at one of the resorts down the beach if Blue Tribes’ larger rooms are too pricey. Hot water and flush toilets join potted plants in the spacious bathrooms, and sea gipsy handicrafts provide some decorative touches. While many of the rooms are large enough for families, keep in mind that this is a popular nightlife area -- Reggae Bar is next door and the nearby Art Beach Club throws bass-thumping parties on occasion. Perhaps this is one reason why rates at Blue Tribes haven’t gone up in years. Check rates at Blue Tribes Garden Beach Resort on Booking.com. Can sleep up to four. Room: Bungalow air-con private bathroom, low season: 1,300 baht, high season 2,400 baht. Notes: Triple. 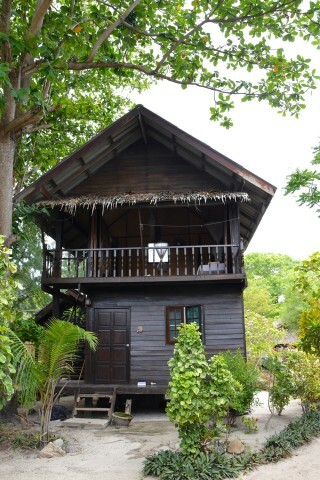 Room: Deluxe bungalow, low season: 1,600 baht, high season 2,800 baht. Notes: Can sleep up to four.